The newspaper industry has been in a funk for decades. While some major newspapers like the New York Times, Washington Post, and Wall Street Journal continue to prosper in this difficult climate many others are enduring challenges. In small towns across America local newspapers have been fighting to survive as area businesses have shut down, populations have shrunk, and advertising bases are dwindling. Newspaper circulation can be challenging. The city of Storm Lake in northwest Iowa has had a local newspaper for many years. About thirty years ago a gentleman who had grown up there decided to open up a second newspaper in the town. Both papers are still publishing and the newest one, The Storm Lake Times, recently accomplished an incredible feat when it was named the recipient of the 2017 Pulitzer Prize for a series of editorials that were written by editor Art Cullen. That recognition brought calls from book publishers who wondered if he would be interested in writing a book? In this interview Cullen describes how he received a phone call from a publisher and that he rapidly rejected the offer that was being made. Cullen's brother, the founder of the newspaper, overheard the conversation and told Art he needed to call right back and say sure thing, I'll write you a book! So he did. 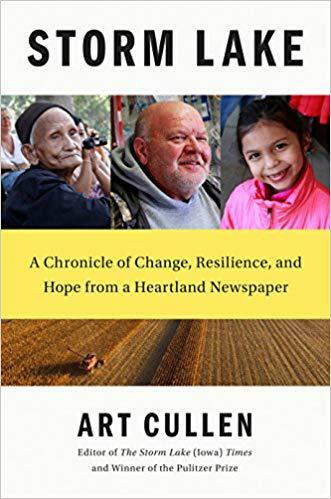 The result is "Storm Lake - a Chronicle of Change, Resilience, and Hope from a Heartland Newspaper." It details how Cullen got into the newspaper business. Readers find out how the newspaper's dogged research into a lawsuit and the entities who were ultimately identified as the parties secretly footing the bill to defend their local county in the suit was the journalism that eventually won accolades from the Pulitzer judges. There's much more here however. Congressman Steve King was born in Storm Lake and represents the area in Congress. Cullen shares his opinions about King and an issue that is crucial to Storm Lake; immigration. King was an early proponent of the border wall that has become President Trump's signature cause. Cullen thinks the idea of building a border wall is absurd. Storm Lake is prospering because it has welcomed a large number of immigrants over the years and their industrious and ambitious presence has been a boon to the community. Then there's the issue of climate change. Cullen has theories about how agriculture in the region must change to reduce the impacts of farming upon the environment. This is an important book. The author gives a great interview. You won't want to miss out on reading this book. There's much to learn from it and it is inspirational! The Book Nook on WYSO is presented by the Greene County Public Library with additional support from Washington-Centerville Public Library, Clark County Public Library, Dayton Metro Library, Wright Memorial Public Library, and Microsun Lamps. Dave Barry is one of those humorists who is always on. He's relentless. He never stops cracking jokes. In this interview Dave had some fun talking about this book that was on the cutting edge of computer technology when it came out in 1997. The world of computing has changed a lot since then and Dave's descriptions of what seemed high tech 22 years ago now seem rather quaint. I took a listen back to some of my favorite interviews for non-fiction titles during 2018 and chose several that really stood out. When I picked segments for this re-broadcast I had a number of criteria to consider. The major considerations were these: did I love the book? Did I have a really good conversation with the author? And finally, was the sound quality good?